SuperEnalotto is one of the most popular lotteries around—especially in Italy, where the game originates. Every week, millions of people participate in this mega lottery, which isn’t a surprise. SuperEnalotto offers some of the largest jackpots around—which, by the way, grows until someone wins! Curious? Read on to know more about it. SuperEnalotto has been around since December 1997, but its roots can be traced all the way back to the 1950’s. Its predecessor, Enalotto, was quite popular back in the day, but that didn’t stop lottery organizers SISAL from completely revamping it when they won the bid for it in April of 1996. Under SISAL, SuperEnalotto became a much bigger hit than before—owing to its easy-to-understand concept and massive jackpots. But that’s not to say that they rested on their laurels—SuperEnalotto continued to evolve through the years. Up until the end of June 2009, the winning numbers heavily relied on the first numbers drawn for regional lotteries held by Lottomatica. The lotteries came from 7 Italian cities such as Bari, Florence, Milan, Naples, Palermo, Rome and Venice (in that order). However, because it was possible that two cities drew the same first number—and thus creating duplicates—it would have made it impossible to win the jackpot had it happened. To address this issue, they changed the system in July 2009 so that the winning numbers didn’t have to rely on the Lottomatica draws anymore. The rest, as they say, is history. 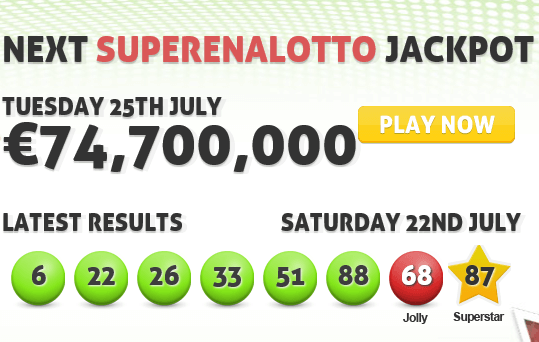 Huge Jackpots: SuperEnalotto is one of the few lotteries around that offers millions in Euros at stake. Rollovers: Jackpots rollover to the next draw if nobody wins the current one, resulting in even bigger prizes. Tri-Weekly Draws: Draws are held every Tuesdays, Thursdays and Saturdays, giving you 3 chances of winning each week. Prize Pool: Previously, prize pools consist of 35% of sales, but have become 60% due to recent changes. Hardest to Win: SuperEnalotto is notorious for being one of the hardest lotteries to win a jackpot in. Their odds are worse compared to big lotteries like US Powerball and Mega Millions. SuperEnalotto’s mechanics are pretty easy to grasp. You select 6 main numbers from a pool consisting of the numbers 1 to 90, while a “Jolly” number—which is similar to a bonus ball—is also selected and determines who wins the second prize tier. Like all lotteries, the object is to match as many of your chosen numbers as possible. Matching all 6 awards you the jackpot, for instance, while the lesser numbers matched means the more you go down the prize ladder. Unlike other lotteries, however, a player must match at least 2 numbers to win. SuperEnalotto also gives players the option to select an additional number called the SuperStar number for an additional €0.50 per line. If matched, winnings can increase by up to a hundred-fold for those who also matched their main numbers, while guaranteeing a fixed amount to those who don’t match any of their 6 main numbers at all. Back when the old rules were still in effect, the winning SuperStar numbers were based on the National Lotto draw that was held in Rome, but have since moved away from that model since the new rules took effect. Instead, a separate draw—which is independent from the 6 main numbers—is held. Here’s where it gets a bit confusing: SuperEnalotto allows you to select more than 6 main numbers through their Integrated System. Essentially, this is functionally the same as picking additional lines, but instead of choosing another set of six numbers from 1 to 90, you simply choose the 7th, 8th, 9th number and so on. Like additional lines, this increases your chances of winning because every possible combination of your chosen numbers is played. SuperEnalotto claims that this option is more popular with syndicate players. Meanwhile, the odds of winning any prize at all—which is 1 in 20—isn’t that bad. Another thing worth noting: you can win instant prizes (from €25 up) if you match your numbers with the ones contained in the magic square that appears on every purchase slip. So, What Happens if You Win? Winners have the choice of taking their prize as a lump sum or as an annuity payment. As far as taxes go, SuperEnalotto usually takes 6% from prizes €500 or more, but if you play from other countries using online agents, then your local tax laws may also apply. The largest jackpot won, €177.8 million, was divided among the 70-strong syndicate. Each of the winners took home around €2.5 million. SuperEnalotto doesn’t have a rollover cap, which means the prizes can grow easily grow bigger and bigger. So far, the longest rollover period experienced by SuperEnalotto lasted for almost nine months. Prior to January 1, 2012, all prize tiers—including the jackpot—were tax-free. Madonna herself bought 100 SuperEnalotto tickets during her tour in Italy in 2012. She won second-tier prizes worth €120,000 and decided to use the prize money to build schools in Malawi. Are you ready to face the odds? SuperEnalotto may not offer the best odds of winning among the most popular lotteries in the industry, but one can’t deny that it is one of the most lucrative games around. Due to the fact that rollovers currently don’t have a cap, jackpots can just keep getting massive! Tri-weekly draws are also a huge plus, giving players three chances to win every week. So, is it worth playing SuperEnalotto? If you have no problem with facing long odds, it’s definitely one of the best lotteries that offer huge payouts.